Although these two individuals seemed to have had certain channels in their minds naturally open, others can nevertheless open up these same super memory channels through training. Both mental mathematics and mental chess require an inner visual acuity of extreme detail, but often in a moving or flexible fashion. A photographic memory is the observational recall often referred to as eidetic imagery in children (37 have the ability at an early age). The ability is rare in adults, and involves seeing an inner picture that lasts for varying intervals with each individual. Some yogis develop a 'super memory' after doing daily exercises in raja yoga (mental yoga) for about a year. Through exercises in visualization, concentration, breathing and altering your state of consciousness -- control of the memory triggering mechanism is achieved and a 'photographic' memory is developed. Practice for no more than 10 minutes per day on each exercise, and soon any page in your study book can be reflected onto your mental blackboard for review. Eliminate verbalizing (internally or externally) during these exercises, because the formation of eidetic images can be adversely affected. Mere after-images are only the initial stages in eidetic imagery, and eventually evolve to more complete visual detail later. An excellent example of someone who really uses her visual memory is Jayne-Anne Gadhia, managing director of the UK financial services company, Virgin One Account. Jayne-Anne never writes things down. Instead, she visualizes lists. As a busy executive, she always has a million and one things going on. Yet, she very rarely forgets anything and can surprise her secretary with her total recall of detail. To ensure that she can focus on one thing at a time, she has developed an interesting technique, managing her memory through visualization I believe everyone has a latent photographic memory. It simply has to be exercised and trained in order to achieve its potential for organizing and remembering things. I have no mnemonics that I am conscious of, but find that if I concentrate on statistics and information, making a mental picture of the words and numbers, they stay with me. To enhance the effect, play a largo movement (60-beat per minute cycle) of specific baroque compositions (Bach, Telemann, Handel, Vivaldi or Corelli) in the background. The slow 60-beat per minute tempo of the largo movement entrains your heartbeat to beat at the same pace, and this relaxed state in turn slows your brain wave activity as well. Hence, your body mind relaxes, but at the same time keeps you alert and receptive. After several months of this practice, your mind develops a semi-photographic memory ability as well. In its simplest form, creating an association or link is to connect the event you need to remember with something you already know. 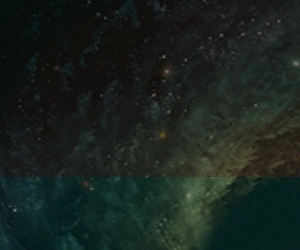 Another approach is to visualize and connect pieces of information into a story or action sequence. For example, if you need to take your dog for a walk, pick up your dry cleaning, and then call a friend, visualize your dog picking up your clothes between his teeth and handing them to your friend. If you are facile with language or have poetic ability, you can use letter or word links or rhyming associations to help you remember. If you are in the habit of doing this, you clearly prefer to tap into your auditory over your visual memory. A memory trace is solidified if there is a small gap in time between the pieces of information that need to be remembered. Using this technique, which is called spaced training, scientists engineered a fruit fly to have a photographic memory. In the same fruit fly species, they triggered a master gene called CREB, which has the ability to goad a number of other genes into action. In this manner, the fruit fly with a fabulous memory was born. Ideally, if we could stimulate CREB in the same way in the human brain, total recall would become the standard for everyone. But there is no known method to turn a gene on or off in the human brain, so even though we all possess CREB, we don't yet know how to galvanize it into action in people. The goal of these researchers is to see if manipulating CREB in some fashion will make it possible to unlock the full power of human memory. One site promises amazing instant results for a photographic memory, allowing you to memorize volumes of information in minutes. Another offers memory tools linked to the godhead and other divine sources. One of my all-time favorites is a program that awards the participant Olympic-style medals for various cognitive areas and includes a game of learning bird sounds as a tool for mind expansion and building brain power. I must admit that the product pitch that began with Lapses of memory can kill caught my attention. In the loci technique, you create an imaginary house and place items you need to remember in specific rooms, using visual imagery. The peg technique involves the mental use of pegs or anchors for each event, and is similar to the loci technique. To work well, the loci and peg techniques require both an aptitude for visual memory as well as considerable mental effort. Teenagers and young adults are able to take advantage of these methods better than middle-aged or older people. The reason for this can best be explained by reference to a graph. If the eye is unaided, it will simply fixate briefly on general areas of the graph, then move off, leaving only a vague visual memory and an interference to that memory because the eye movement will not have 'registered' the same pattern as the graph. 1 The visual memory itself. 4 The visual memory of the rhythm and movement of the tracer. Tap into the memory secrets of geniuses… Discover The Untold Mind And Memory Secrets Used By The World’s Smartest People To Help You Unleash Your Full Potential! 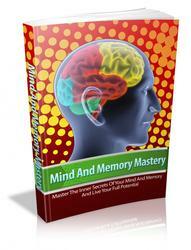 Finally You Can Fully Equip Yourself With These “Must Have” Mind And Memory Tools For Creating Your Ideal Lifestyle! Let’s face it, We all know the fact that we aren't using more than 10% of our brains. If we could, we'd be achieving much more and giving our fullest gifts to the world.